Should I straighten out bent tines? They aren't pointing straight at my pickups. Are you sure they're bent? Is the tine hitting in the middle of the hammer tip, or near the edge? Any chance they're merely out of alignment? It seems odd and unlikely that the tines would be bent, as they're under an area that's kind of "protected" by the other metal and wood parts on the harp. Unless one were to take the harp off, there's not much that can bend a tine in a direct impact. 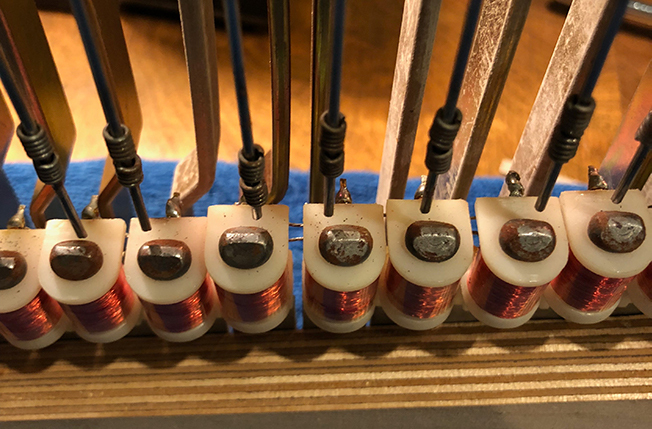 If the tine(s) look straight in and of themselves, you may need to loosen the cap screw that holds the tine to the tone bar, then simply realign so the tine is properly with the magnets on the pickups. Now I'm wondering, are you hearing low output from keys with the "bent" tines? When you get the tines re-aligned, you may need to adjust the pickups and do a little re-voicing as well. I agree--bent tines are very unlikely. However, near the center of your picture you can see 2 tines that are not well aligned with their pickups. However, you can also see a gap between the pickups. If you loosen the pickups and move them so as to close the gap, I think the poor alignment will mostly disappear. OK, I need to read up on tine alignment. I’ve seen how to align them up and down but not side to side. Thanks. The tine should run parallel and straight to the tone bar. If it is parallel, then the reason you may not be lining up properly with the magnet could be bent mounting screws on the tone bar. You can check by rotating the screw and looking for the front of the tine/tonebar to move left to right as you turn the screw. A temp fix is to rotate the screw until the magnet and tine are properly positioned. However this may not be optimal for voicing. Best to get a straight replacement screw. They're available from a few sources. Don't just use some hardware store replacement. Proper screws have a non-threaded part of the shank that allows the screw to turn without distorting or compressing the tone bar grommet. Page created in 0.149 seconds with 35 queries.